Age spots, also called “liver spots” or “solar lentigo,” are usually the undesirable result of sun exposure and the skin’s natural aging process. They appear as brown spots, or harmless patches of uneven skin tone and pigmentation, and result when excess melanin (skin pigment) in the skin cells accumulates. The main two factors contributing to age spots include sun exposure and age. Age spots are not just restricted to the facial area but are commonly found on the shoulders, upper back, neck, décolletage, backs of the hands or any areas of skin that have had the most sun exposure over the years. Age spots occur in people of all skin types, but they tend to be more numerous in fair-skinned individuals. Age spots can be round, oval or irregular in shape. Their colour varies from tan to dark brown or black, and their size can range from freckle-sized to several millimetres or centimetres in diameter, sometimes grouping together and making them more noticeable. Age spots are categorized as hyperpigmentation or overactive pigment cells and are caused by exposure to ultraviolet (UV) light, which accelerates the production of melanin. On areas of skin that have had many years of frequent and prolonged sun exposure, age spots appear when melanin becomes “clumped” or is produced in high concentrations. 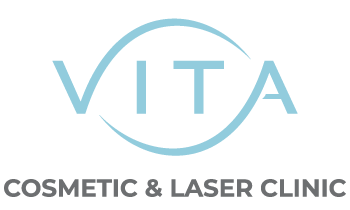 Vita Cosmetic and Laser Clinic offers highly effective treatment procedures for all types of age spots on all areas of the body. Our medical team of highly trained skin aestheticians, registered nurses and doctors uses the safest and most advanced technologies to achieve targeted, long-lasting results. Say goodbye to tired, dull-looking skin – and hello to a more vibrant, younger-looking you! Only ThreeForMe™ laser treatments address three common skin concerns – wrinkles, sun damage and facial veins – all within one procedure. The procedure takes only 30 minutes and has minimal downtime, giving you the best possible results while still fitting within your daily schedule. The first step addresses discoloration and facial veins using Intense Pulsed Light (IPL) technology. The second step addresses wrinkles and fine lines using a microbeam laser technology to stimulate collagen and elastin production – the keys to the support structure of our skin. Combining these technologies provides the benefits of both in much less time – giving you younger-looking skin, sooner. You will see continued improvement in your skin’s appearance both during and after a course of 1 to 3 treatments, with visible results after each individual treatment. You may see immediate results in facial veins, along with a darkening of the brown spots. These dark spots will flake off over the next 1 to 3 weeks, leaving you with a glowing appearance. Over the next 6 months, you will see progressive results on any fine lines, wrinkles or scarring, as your skin naturally responds to the treatment. Contact us today to schedule your free age spot removal treatment!